jailedart | While on honeymoon, my husband and I visited the Pensacola Museum of Art which is housed in the old city jail. I thought of it as an oxymoron, how could you jail art? Thus Jailed Art was born. 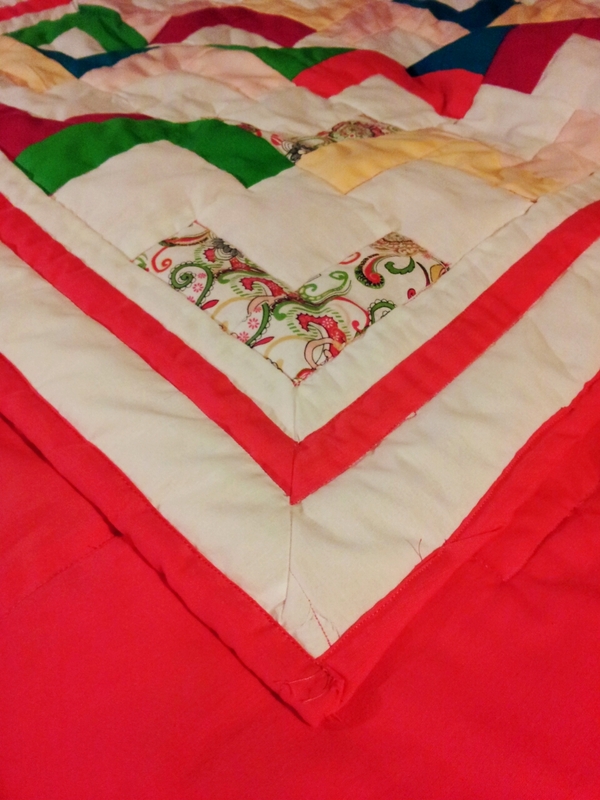 Some quilts call for hand quilting, some do not. But how many of us can afford a several thousand dollar long arm or free arm quilting machine? 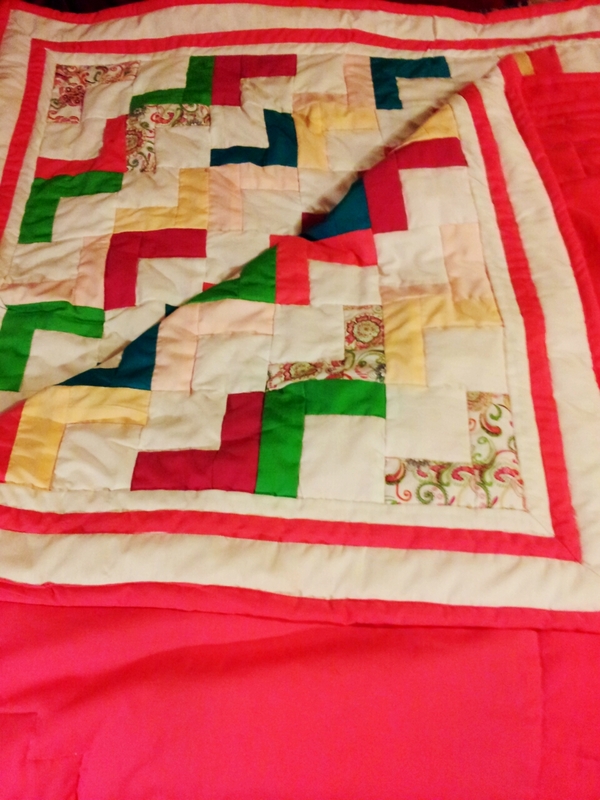 It is possible to machine quilt large quilts using your regular, run of the mill, sewing machine. 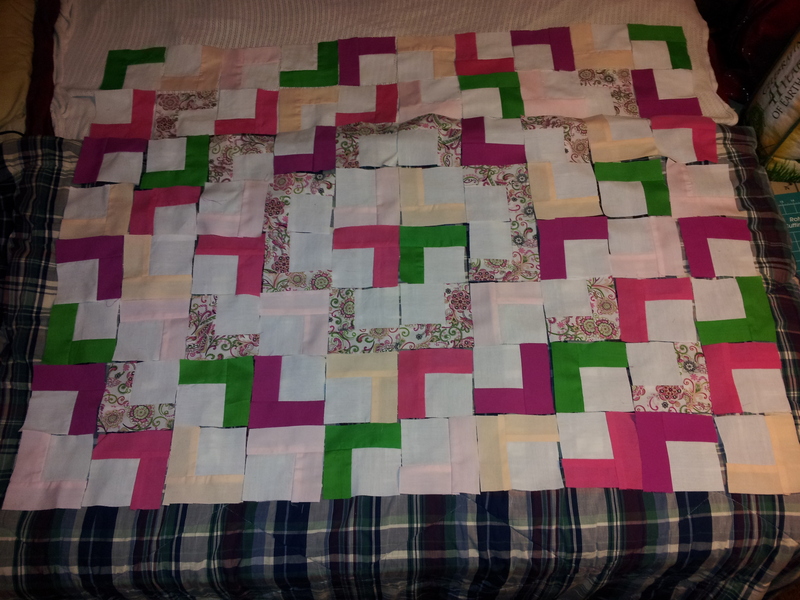 Start with sectioning out your quilt. 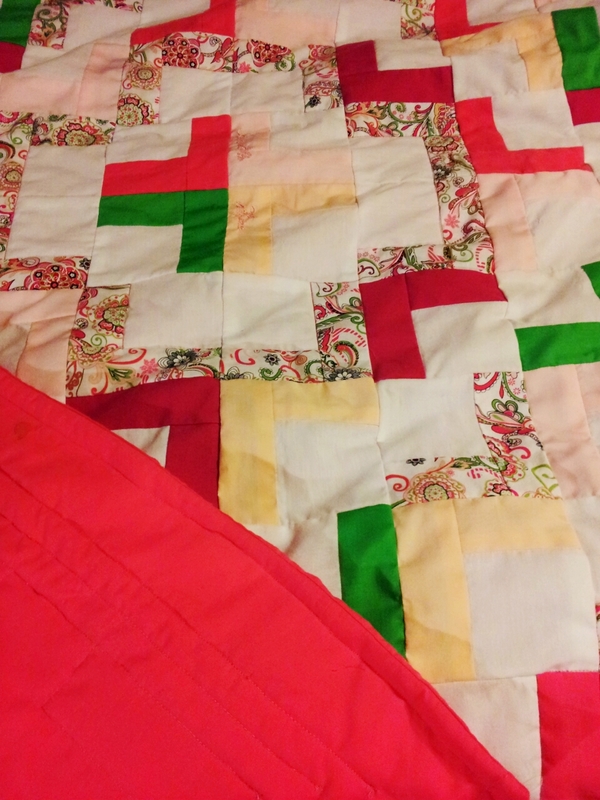 Quilts are nothing but blocks of fabric, so break up the blocks. 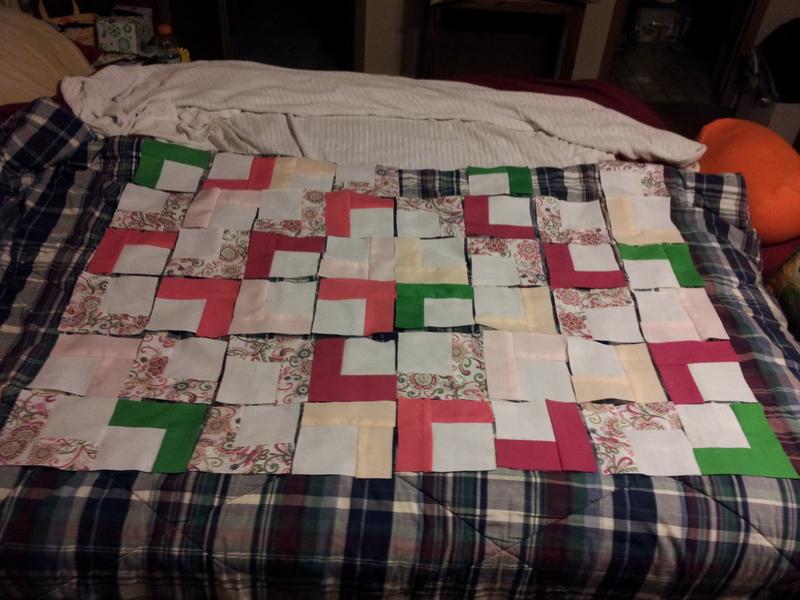 I find it easiest to split my quilts into rows. 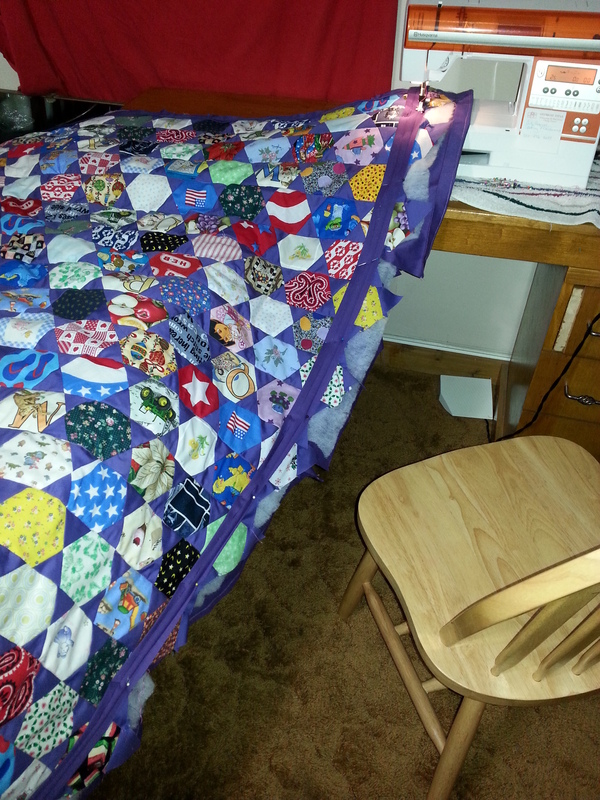 Above, I machine quilted 5 rows of the quilt at a time. 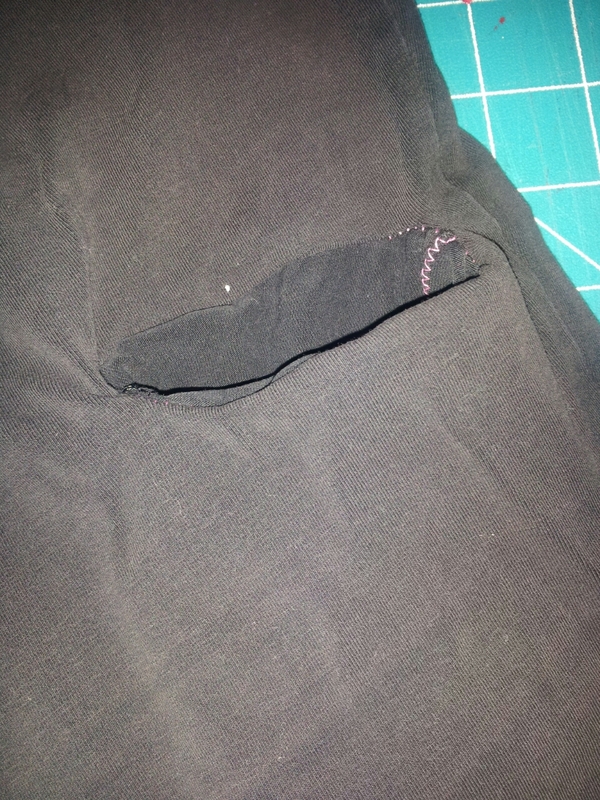 Be sure to leave plenty of backing fabric to work with around all edges. 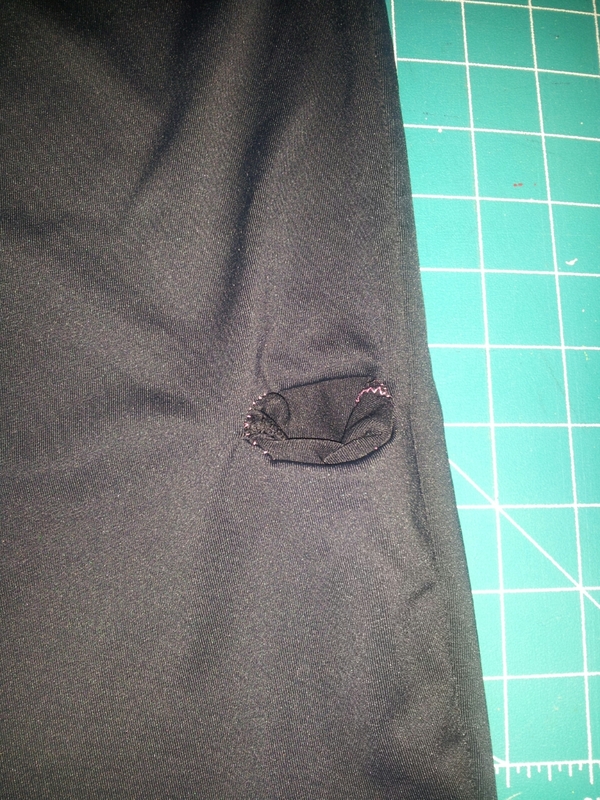 You can always trim away excess fabric but you can’t easily add more. 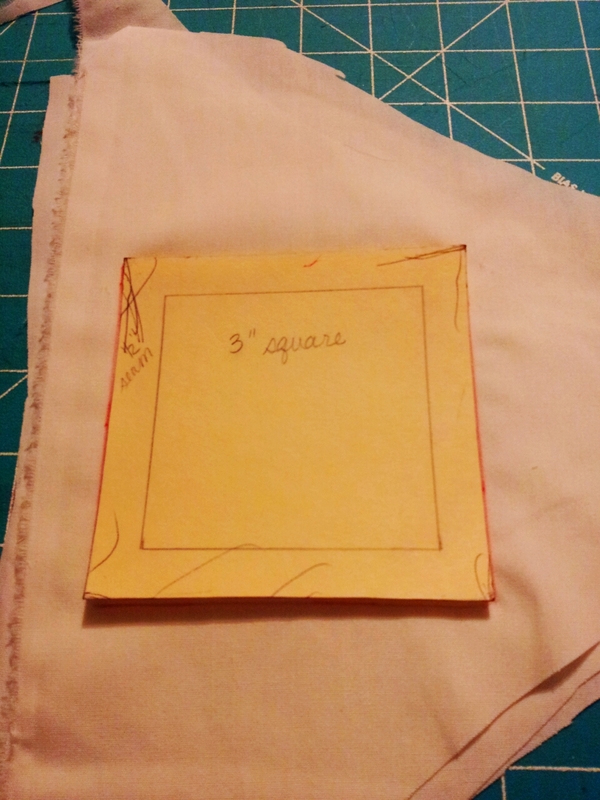 Try not to quilt all the way to the edge, leave yourself at least a 1/4″ of an edge. 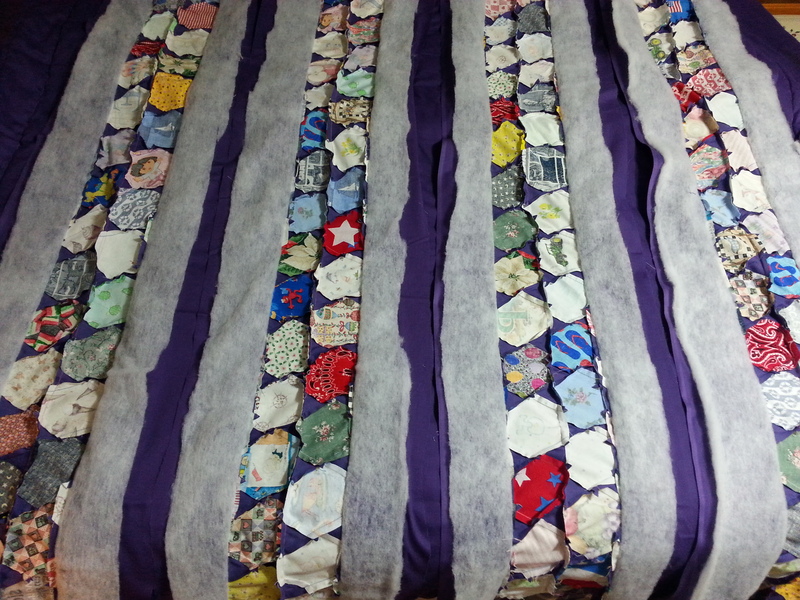 After your sections are machine quilted together, arrange them in order with the backing facing you. 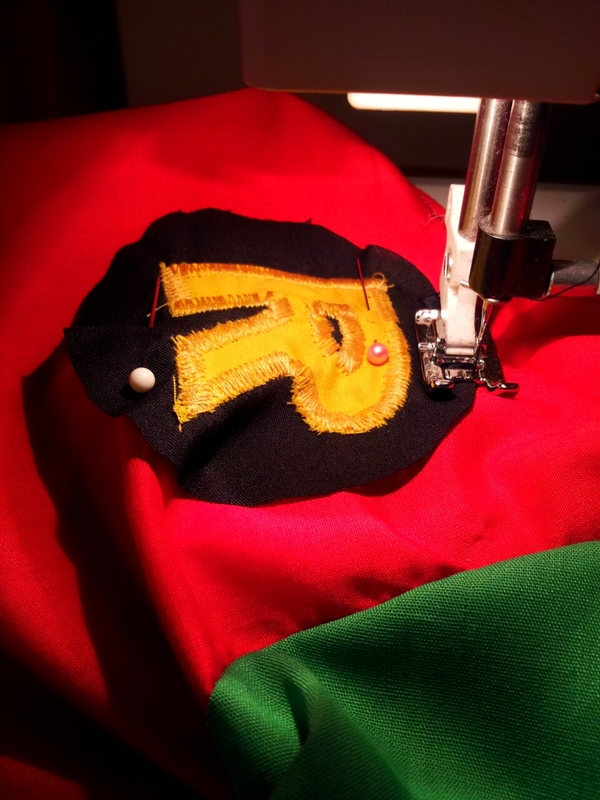 Pin together and machine stitch the rows together, being sure to only stitch the top together, not the batting or backing fabric. 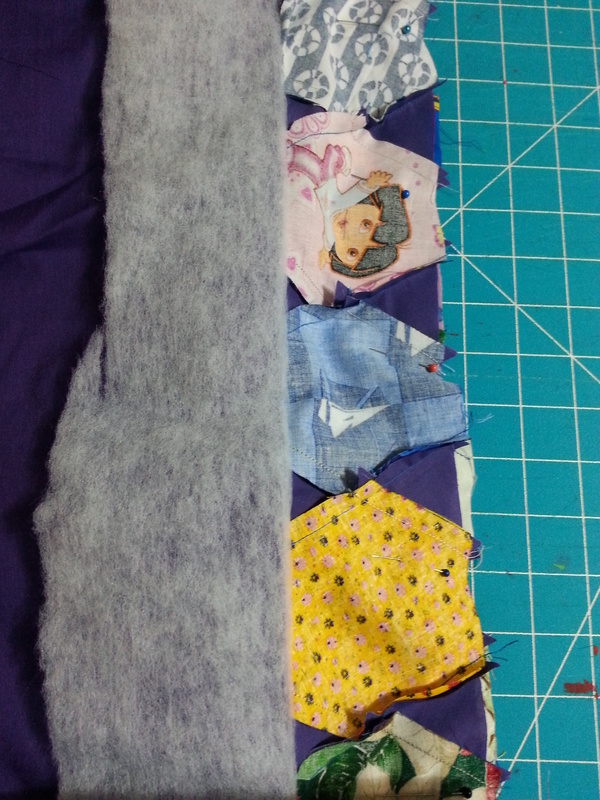 Notice how I pulled the batting and backing fabric back from each row I needed to stitch together in the photo. 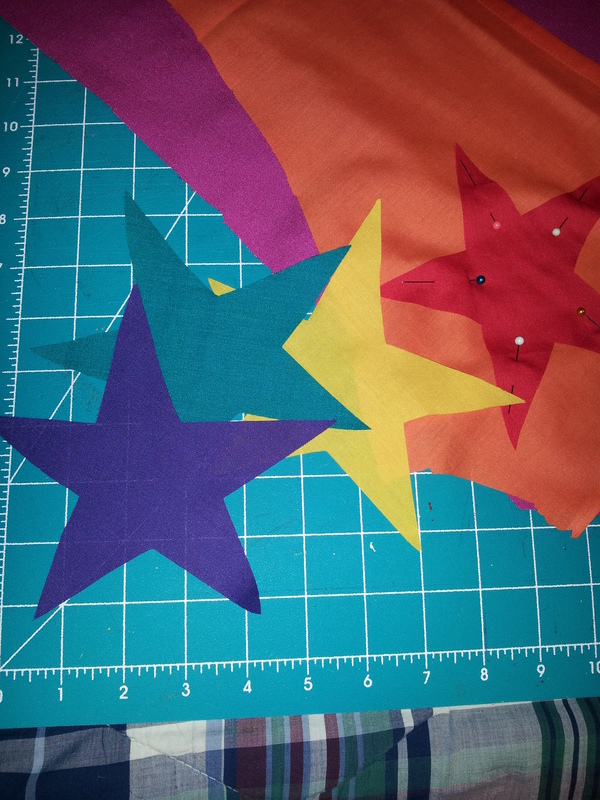 Once the entire quilt is pieced together, lay the batting and backing back where it belongs and use a simply whip stitch, blind stitch, or your favorite to secure the sections of backing, just as you would for the binding. 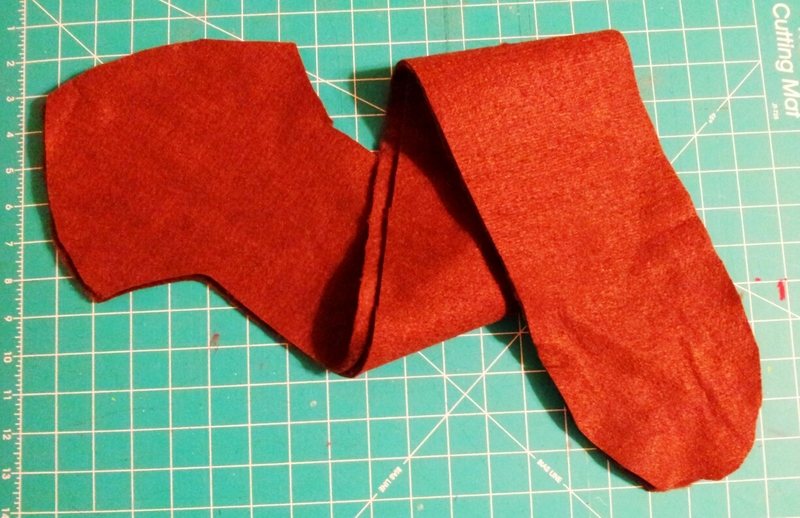 Finally finish off with your borders and binding. 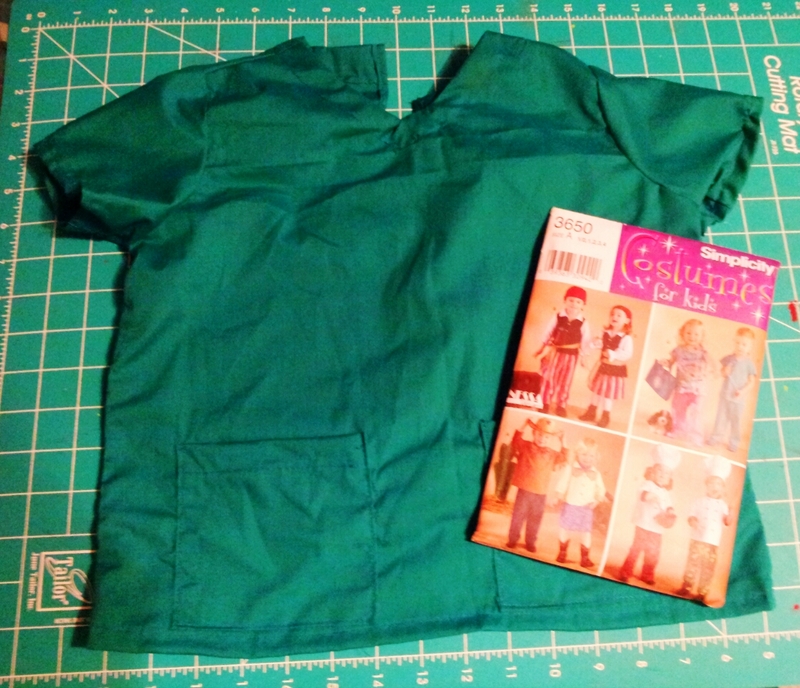 Seven years ago a friend in my quilting circle gave me a pattern piece set used for making I Spy quilts. 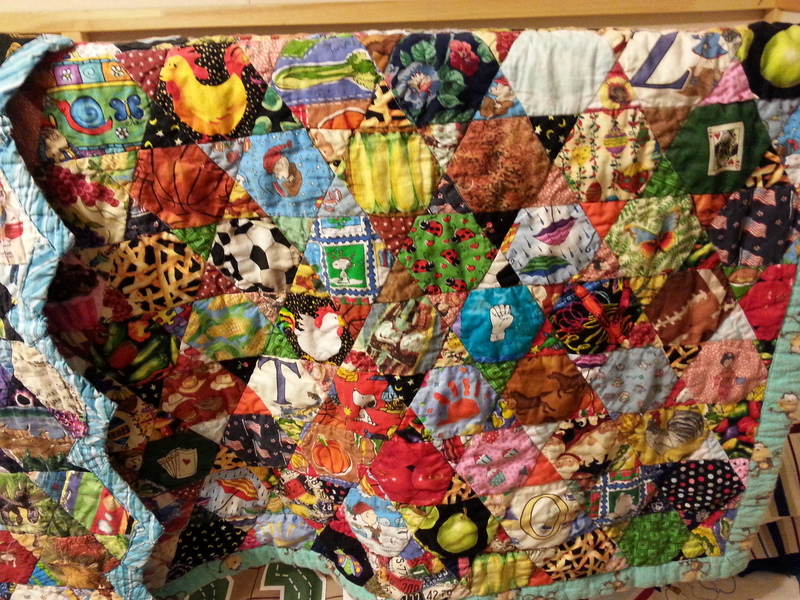 I have now made close to twenty I Spy quilts since then. What’s an I Spy quilt? 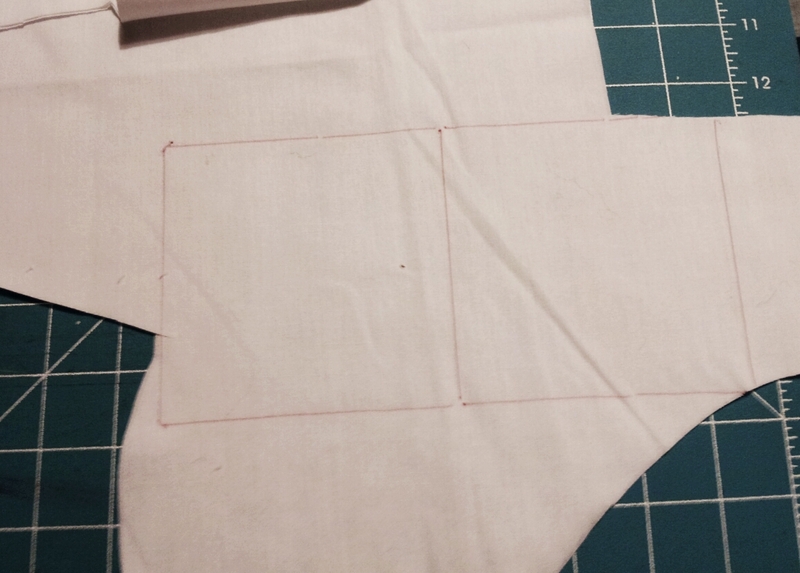 Each piece of fabric has a different print on it (or in theory, but that’s a lot of fabric for a budget to muster). Kids take turns pointing out an object they see, like a cat, and the others try to guess where on the quilt the cat can be found. Babies also enjoy looking at the various colors and objects found on each piece. 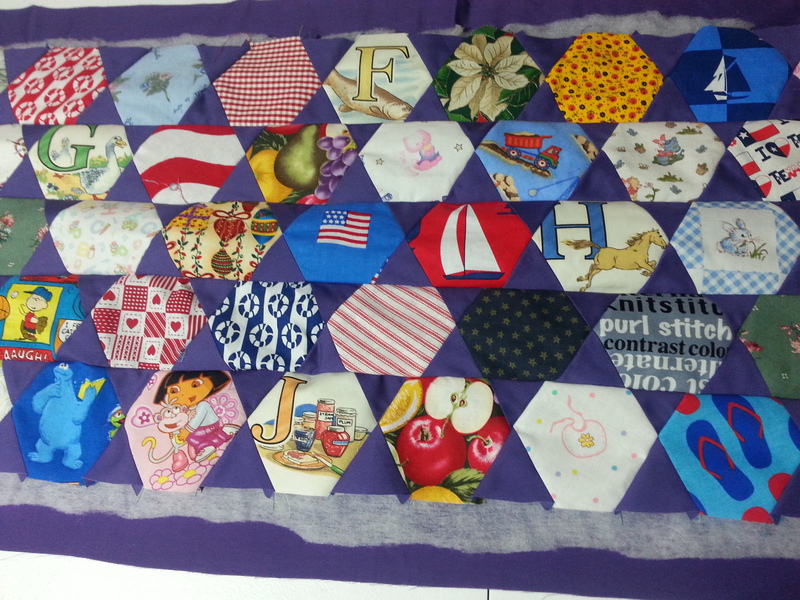 Chatterbox and Hugs still use their I spy quilts. Once you start making them for friends and family, it’s hard to stop. This is my number one request and my go-to gift for baby showers. Chatterbox’s is on the left, Hugs’s is on the right. 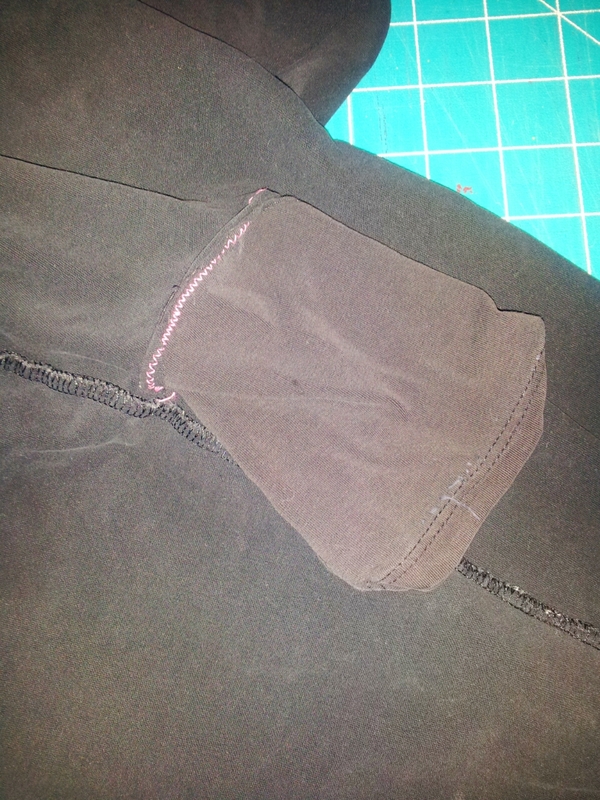 See that zigzag binding going on? I suggest to not try it, stick with a straight edge. It was seriously hard for me and I have refused to do it since the first time I tried it. 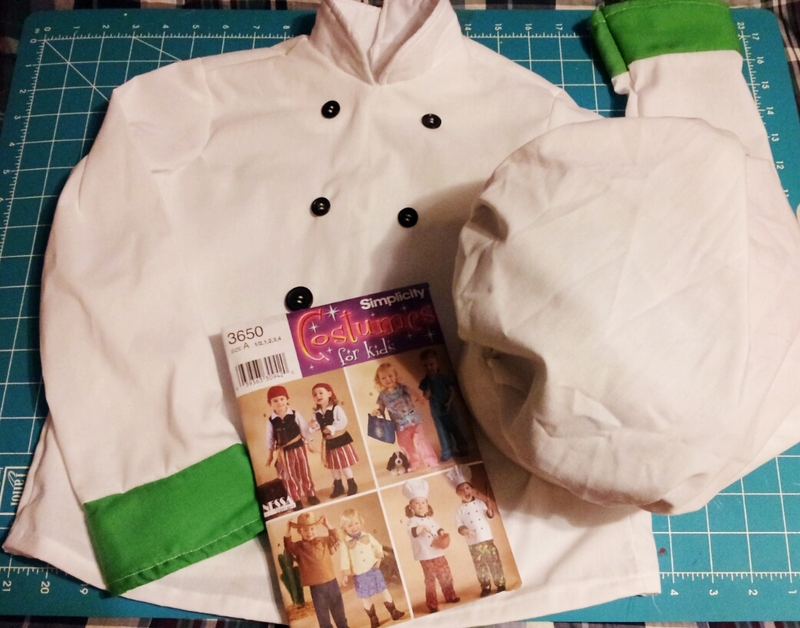 In budgeting our cash for the month of October, Halloween costumes for the boys were a given. That is until we tried to price some out at Walmart. I was expecting to find costumes around $10-$12 each; not a chance it was $25 and up. I dug out Chatterbox’s Batman costume from last Halloween. It was so big on him last year, I wondered if it would fit him still. 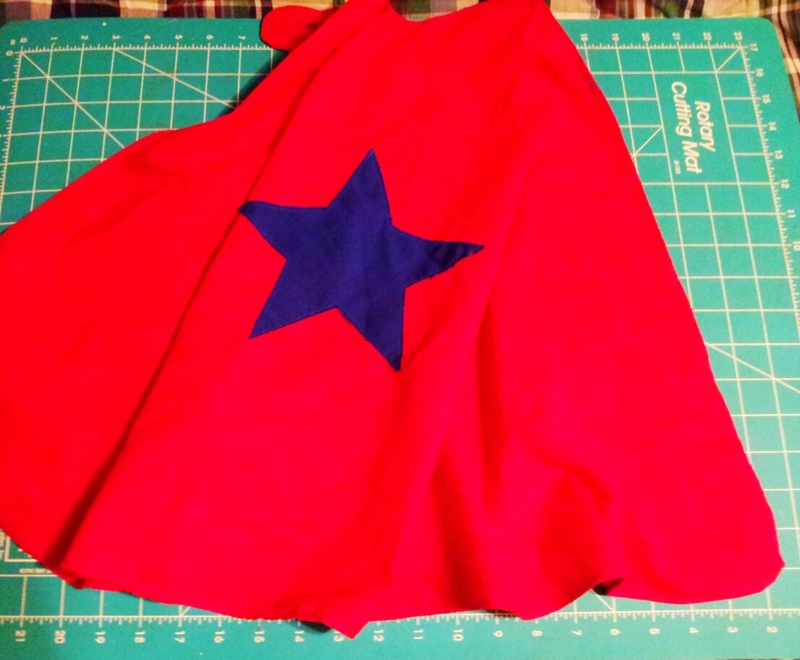 Lo and behold it does…one costume down. I was unsure about Hugs…would he even want to wear a costume. We have two that were given to us when Chatterbox was his age but they were all very hot: a giraffe and a dinosaur. Halloween temps in Texas are cool not cold. A coworker mentioned her husband and son would dress up every year in complimenting outfits. That was the final push for inspiration I needed. 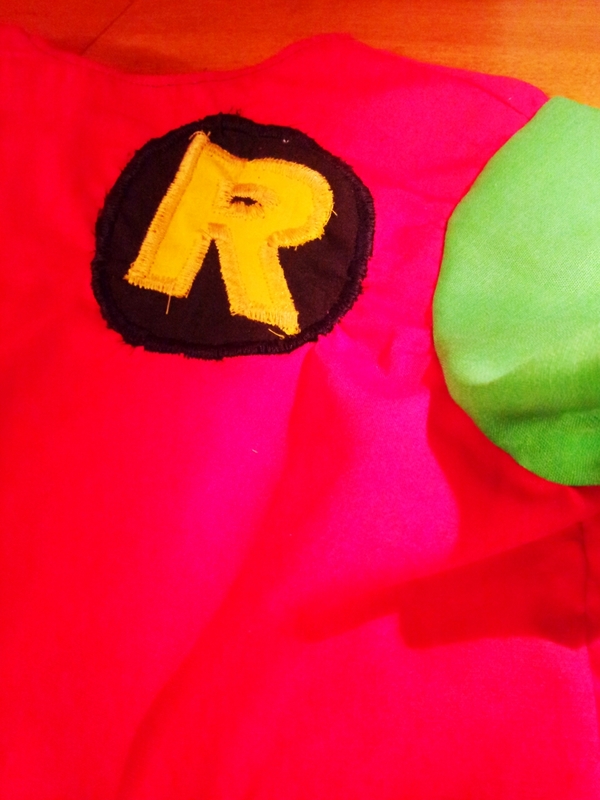 I have a ton of solid cotton fabric therefore Hugs can be Batman’s trusty sidekick, Robin. 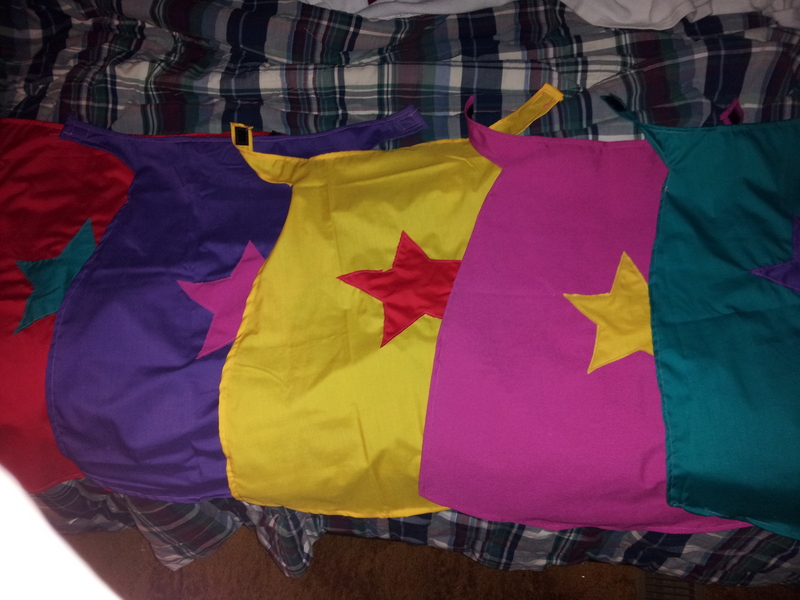 The top is complete but I have a bit more left to finish on the pants. I can’t wait to see them side by side! 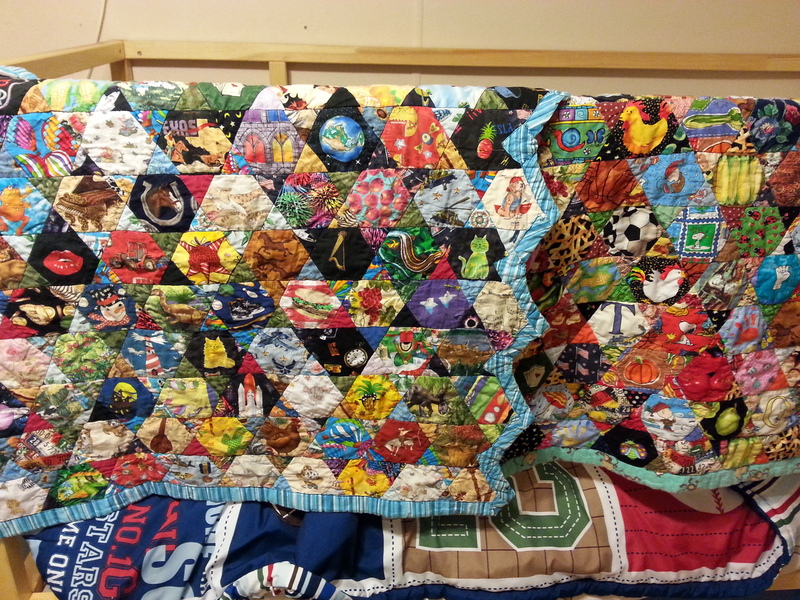 This is by far the hardest quilt I’ve made and not for the reasons you may think. I put much thought into this one and consulted with the Hubs often. A close coworker divulged her tragedy a month ago, she had miscarried her sixth child. I wanted to do something meaningful for her and her husband. I thought a quilt in memory of her daughter would be a nice gesture but you never know how people will handle death so I decided to ask her permission first. I wanted it to be a happy reminder not a solemn one. She gladly gave me permission. 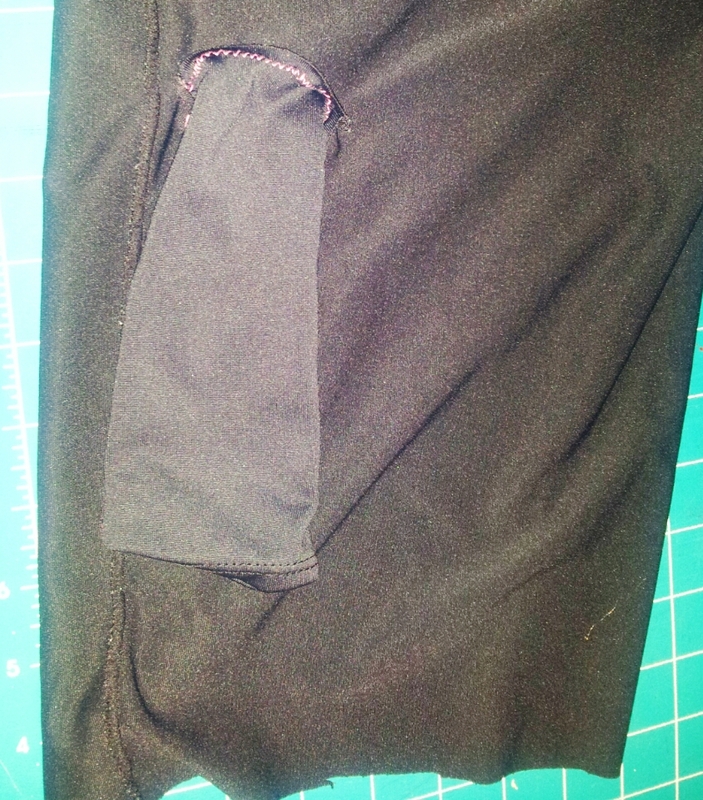 I didn’t want it to be too girly but I did happen to have mostly pink fabric in my stash. 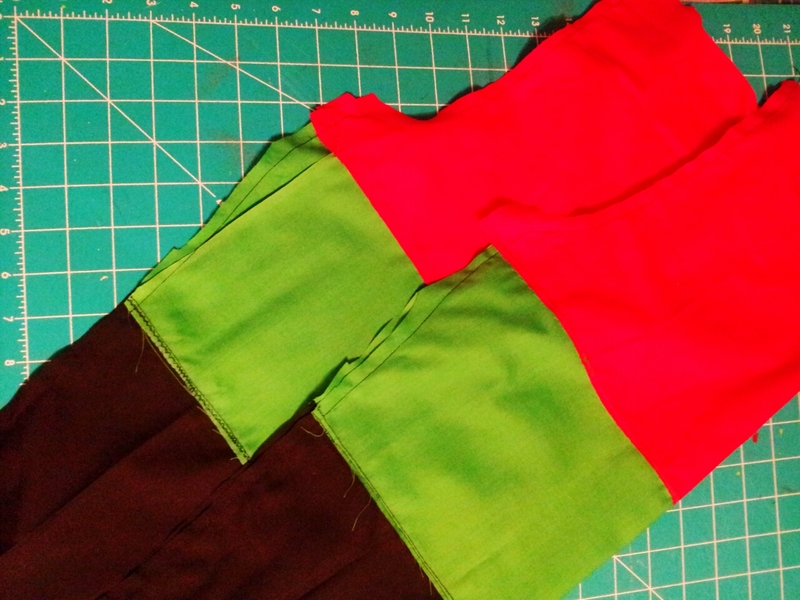 My husband helped me decide on the random color patterns. I wanted to embroider the child’s name, Annabell Hope, in the center but we didn’t want all of the attention drawn to the name. I wish I had had a bit more of the paisley fabric because it tied all of the colors together so well. 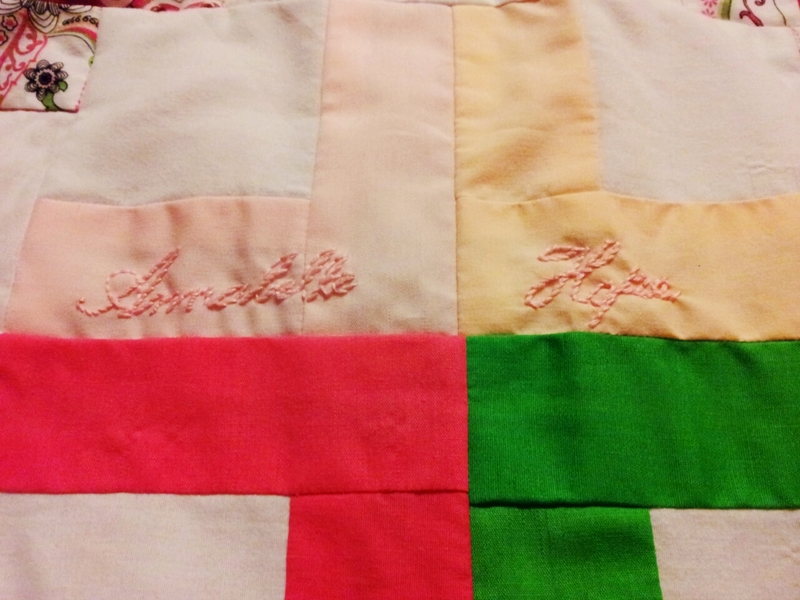 I embroidered her name by hand, it was too delicate to even try to attempt with a sewing machine. My friend was thrilled to see the finished product and I felt like it would be seen as a happy reminder. 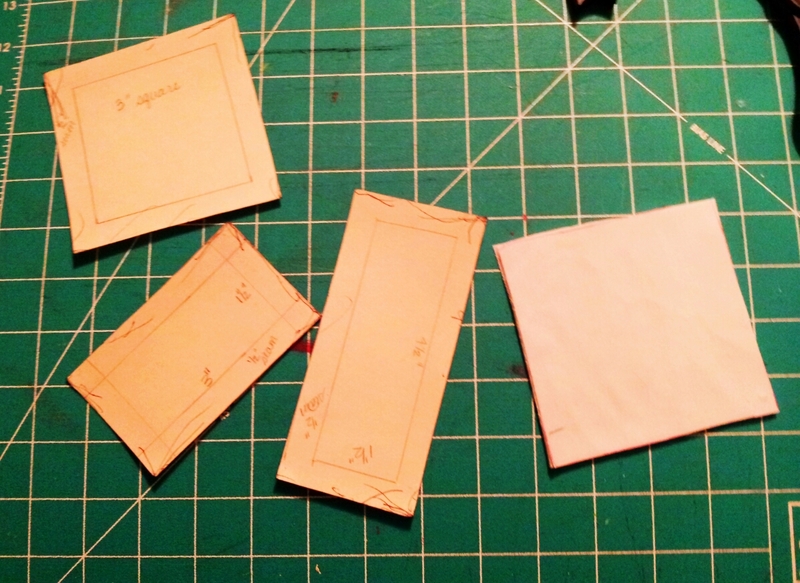 I’m glad to be back from a mini hiatus and recomposing a plan for this blog. 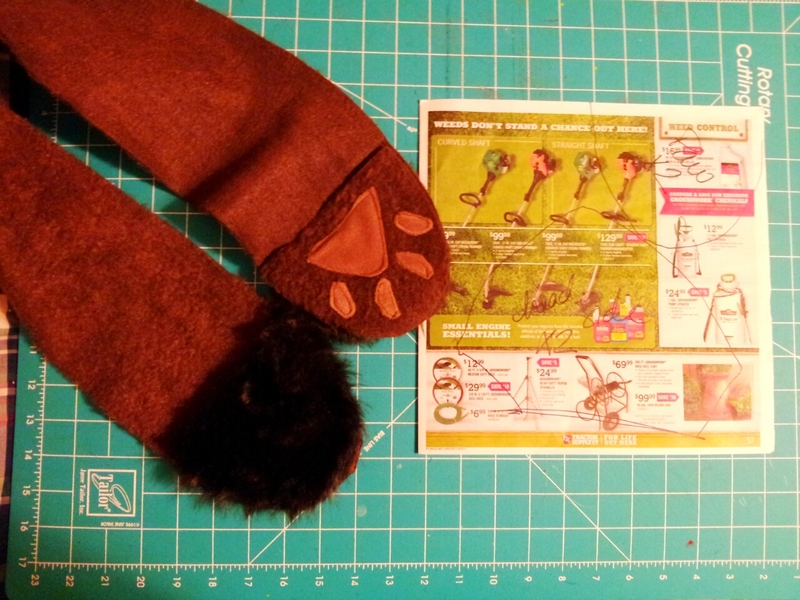 I appreciate everyone that has been following this blog; it will now just encompass arts and crafts projects that I am working on. 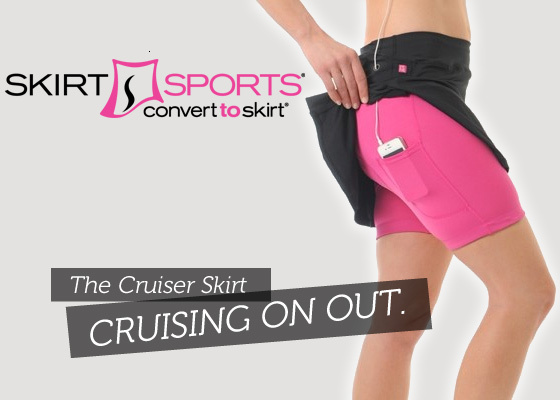 For those interested in running, you can find me at Running in Austin. For those interested in accessibility, you can find me at Keeping Austin Accessible. As with Jailed Art, I am still reworking the above two sites as well and copying over any previous posts, so please bear with me as the clean up continues.